We’ve got a lot to catch up on. It’s been the better part of a year since our last issue. I solemnly swear that won’t happen again as long as I’m editor and the last person standing. If that means just giving you one article a month, then that’s what we’ll do, but something you will get. After a bit of soul-searching, we on the team realize we tackled too many things with too few people. And when two of our team are also core Textpattern developers (a lot has been accomplished there in recent months) with other community projects they’ve taken on as well, we need to find a balance. So we’ll be adjusting some things to help find our groove. In some respects, this has been happening already, like with the temporary freezing of the Exhibit (it will come back). But we’re also going to change the magazine a little bit. Nothing radical. In fact, we’ll be lightening things up—fewer ad units, less presentational distraction, and more focus on content itself. Modifications that will make for better mobile experiences too. 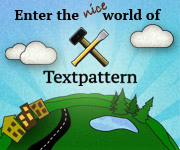 We want your articles if you use Textpattern to create websites for other people, or you are a recipient of a website made with Textpattern. If you’re an ace designer or crack developer and have put something together you’re happy about, pitch it to us. 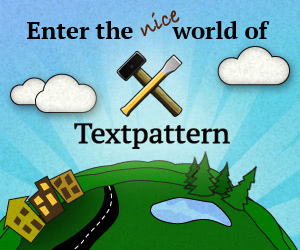 Likewise if you’re a mad blogger powered by Textpattern, mad write something here. Marquee! We want your articles if you work in the digital industry, regardless of how, and especially if you are an independent. Tell us about your tools, your process, your environment, your secrets to success. Inquiring minds want to know. We want your articles if you have something on your chest that really needs to come off. We call this having an informed opinion, and we all have them. Express what’s bothering you through a cogent, articulate argument. We’ll try and find someone with a counter argument and post their side of things too. Step up! We want to hear from most anybody that wants to write for us in the scope of what this magazine is concerned with. On that note, a couple of words about what we don’t want. We do not want people associated with content farms soliciting us with articles so they can get link backs to their content farms. Sadly, we get a lot of this kind of offer and you guys can just stop right now. Save that for any number of other dime-a-dozen rags that think they’re fooling Google.